Frente al Atlas, a 15 minutos del centro de la ciudad ya 20 minutos de jamaa lafna Marrakech, piscina y jardín frente a la villa de arquitectura Kasbah que combina modernidad y tradición, un hammam tradicional para usted. pero los padres se preparan para usted el menú tradicional y su escucha para que tenga unas vacaciones de ensueño. La ciudad ocre a tus pies! Tranquilidad y tranquilidad aseguradas, cerca, diferentes comunidades están ocupadas trabajando sobre el terreno. Esta fusión étnica, lleva su historia, su cultura, su know-how y no deja indiferentes a quienes quieran acercarse a ella. Nous avons passé un super séjour !!!! A fun few days away. We had a lovely stay at Kasbah Rouge during February half term. An amazing house and pool — we had the top two floors while the ground floor was inhabited by Hakim’s (the owner) parents. The garden and pool are lovely (albeit very cold this time of year!) and the newly built wood-fired hammam (spa) was brilliant to experience. The apartment is slightly lacking in comparison to the amazing outside spaces. The kitchen is very basic compared to the rest of the house, as was the bathroom — the shower has very low pressure — perhaps all the more authentic for it? Many items listed weren’t present — the TV had no DVD player and there is no washing machine, oven, grill or toaster as listed. The beds were very comfortable, and plenty of cosy blankets were available (which we needed at this time of year). The villa is a long way outside the city, in a remote village (twice as far from Marrakesh as illustrated in the HomeAway listing). Fortunately Hakim was always available to drive us around (including to a wonderful Camel ride) and to supermarkets / recommended restaurants. He was very helpful and an invaluable guide. Overall an amazing place. Recommended. Dan and family were wonderful guests-great communicators,friendly. We have passed good Time. We would welcome them all back anytime. Bon séjour, propriétaire accueillant et au petit soin. Hamam nikel et endroit agréable. On était ravis de recevoir Alex et ses amis autant pour leur gentillesse que pour leur amabilité.agreable a parler et agréable à vivre. Ils ont découvert la magie et la beauté de marrakech sous toutes ses formes.paysages ensoleillées. Le hammam .La succulente cuisine,et surtout les gens souriants et sympathique .ils seraient toujours les bien venu. We decided to have Christmas in a warm country this year. Marrakech is lovely during the day from 10.00am onwards until around 7pm. So be prepared to wear a coat or jacket if you go out in the evening. We were around 25 minutes from the centre of new Marrakech so relied on transport to get us to any tourist parts of the city. The villa is very secluded, there is not much around, you need to travel to get true supplies so be prepared. The views were beautiful of the mountains. The pool is not heated, so if you can take a cold swim you will be ok. We did have to ask for basics such as an iron and a hairdryer. There is no kettle, there is a coffee machine. There is no microwave and the cooker did not work,and the water pressure especially in the bathroom leaves a lot to be desired. This could add to the authenticity or not be to your liking, it has to be your choice. The family were on the ground floor of the riad, and were very kind and cooked a couple of lovely dishes for us which were welcoming. We also enjoyed the breakfast made by their help Samira who was a lovely lady. If you do not speak French, the language barrier could be a hinderence. The garden is wonderful and all very natural, so wonderful if you want to just relax with your thoughts. We did see some wonderful sights in Marrakech, including the mountains, the Souk, and the desert for camel riding, guided by the owner Hakim who made himself available for the whole trip. Would suggest that you clarify his charges for using his taxi service for each visit each day as this was a little confusing for us. He did show us the real Marrakech, however, should we go again, we may hire a car, or be selective with use of Hakim. You will need to secure transport if you stay here as it is secluded. We especially enjoyed our visit to the mountains and our visit to the Souk, would definitely like see more of those places. In conclusion, it was enjoyable and the owners were very friendly and helpful, however, we would probably be more selective in our use of them due to the cost element which was not clear. In terms of warmth, it was very good. The perfect guest.thoughtful, friendly .lovely to talk to and a pleasure to have around . Séjour au top...des personnes accueillantes et adorables qui se mettent en 4 pour vous satisfaire...Si vous avez besoin de quelque chose, Hakim est là pour vous trouver l'exceptionnel..tel que cette boutique d'épices dans le Souk. Et surtout de pas manquer le Tajine d'Atika sous la tente avec la séance de tatouage de henné de Samira.....A quand les prochaines vacances car nous avons encore plein de choses a visiter. Fabrice et Marie sont sympathiques et très gentil.ils sont respectueux et exemplaires. Nous espérons les revoir prochainement . c'est fut un plaisir de les accueillir. Bon deja pour commencer la villa est top et conforme aux photos . elle a vraiment beaucoup de charme on se sent au maroc c est super tranquil et on px admirer l atlas et de super coucher de soleil.la piscine sans vis à vis rien a dire. tres bien situé un qq min d un supermarché et 10 min en voiture du centre jama elfna. un havre de paix vraiment. 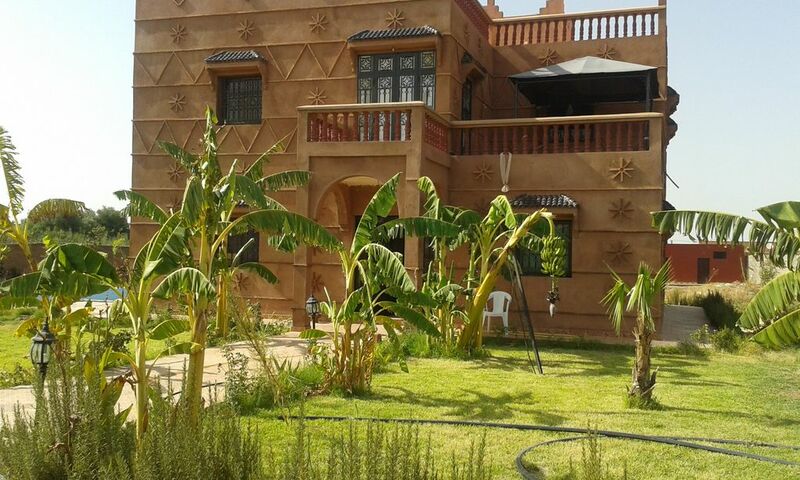 voila pour la villa à propos des hotes la c est encore mieux Hakim le gerant est toujours à disposition avec sa petite famille ils ont pris soins de nous comme des reines les repas sont excellent c est vraiment l ambiance marocaine conviviale que l on recherchais et on a tout trouvé.il est venu nous chercher et nous a redeposé vraimemt c est sure que l on reviendra on a trouvé pas qu une villa mais une famille et rien de plus beau🤗🤗🤗🤗🤗. Tout d'abord nous vous remercions pour votre appréciation et votre gentillesse a notre égard. Nous espèrens vous revoir prochainement avec autant de plaisir et d'amitié.